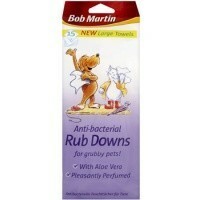 Bob Martin Anti-Bacterial Rub Downs are the quickest and easiest way to give your pet a good scrub and clean, without having that tiresome hassle of rinsing them through with water. These fantastic Anti-Bacterial Rub Downs remove loose hair, dirt and nasty odours, leaving your pet’s coat clean and fresh. The added anti-bacterial agent helps to make sure your pet is properly clean! For grubby pets, these pleasantly scented wipes contain added Aloe Vera to help nourish the skin and coat. Pack contains 15 large wipes.